Approaching the podium is a woman with bright pink streaks in her hair, dressed fully in black and with the brisk walk of someone possessing the cool sort of confidence. Automatically, through just her physical appearance and the spotlight setting, we label her as artistic, intelligent, and possibly Goth. She speaks. No accent proves a North American upbringing. Closer inspection brings piercings to light, extra layers of eyeliner, and the superior quality of her shirt’s fabric. A rebel? An intellectual? Upper-middle class? We make guesses without even realizing we are doing it. Her statements are digested with certain awareness, a new twist, based on accessories and hair choices and even her title, giving more weight to her speech than the written word alone could ever hope to convey. It is unfair, biased, and yet completely typical. Our appearance, both what we choose to wear and what our genes choose for us, cannot help but project certain clues to not only our tastes and ethnicity, but our personality, our sexual orientation, our social class, our upbringing, our education, even our hangouts. Though these generalizations are often inappropriate, especially in the rather liberal society of the Americas, this habit of ours is best put to use when people wish to be recognized for their preferences. Whether by a turban, a designer handbag or a cat-eared hoodie, connections are instantly forged when two people share such uncommon markings. In the world of Second Life, anything is possible. Upon sign in, users can manipulate their default human avatars to be anything from a leggy super model to a “flying spaghetti monster” (as Rosa Mikeal Martey, our presenter, commonly used as an extreme example). Despite this ability, the same phenomenon occurs within this virtual realm: people put themselves into categories. Different than real world ones, but categories none the less. 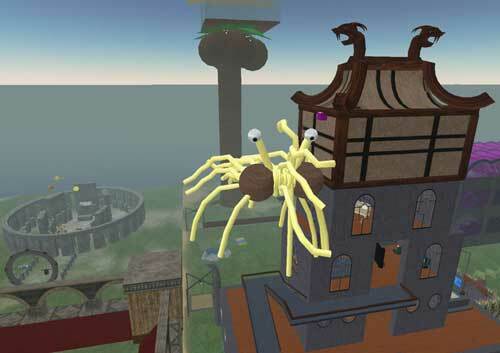 The race of flying spaghetti monsters is, regrettably, a one-of-a-kind breed. However Pseudo-human fox women with giant breasts can be found en mass. Martey and Consalvo’s study of Second Life society first began with wishing to test the capabilities of the medium by creating a simple point-and-click adventure game. But as avatars began arriving and playing through the level, the point of interest became not the ability of strangers to work as a team, but primarily how they looked while doing so. On the doorstep of their island arrived animals, robots, elves, werewolves, vampires and even a few recognizable celebrity or fictional character skins. The usual standards of humans no longer applied. Variations of species were more common than skin color. Despite this preference for the strange, avatars more often than not had a clear choice of gender. And usually that gender was female, though the creators were careful to have 50-50 male and female user participation. Another interesting decision that many users made was their clothing. Knowing they were about to participate in a game taking place in Victorian/Steam-Punk style city, many of the seasoned users purchased or made costumes to match. Outfits were also provided for those who hadn’t had the time. Still, in this virtual world where changing clothes is as easily as the click of a mouse, users were strangely attached to their style and, knowing they were being documented, many insisted on keeping their usual outfits for the sake of identification. If they were members of a popular Western simulation, they wouldn’t dare take off the cowboy hat in online public. Much like a diva can never have a bad hair on the red carpet, it would be considered disrespectful of an ever so carefully crafted personae or image. The world of Second Life, despite its assets of anonymity and un-restrained creative options, has sadly become, in majority, nothing more than a distorted mirror of the real world. The goal of most avatars is to be noticed, as either part of a strange society or as a fantastically attractive version of their real selves. As the Madness Machine Study has discovered through their social experiments; it is more a medium of enhancement than creation, of belonging rather than innovating. And, as with most applications that are driven by user content, its primary business is adult entertainment. But we shall not fret. As long as there exists at least one flying spaghetti monster in-world, we have hope for imagination.